Long before our Mother brought us for our swimming lessons at Carl Adams’ there were a number of mills along the Tay River that harnessed the power of the water to produce local products. In the early 1800s the area was enjoying its first surge of settlers which had come mostly from Scotland and to a lesser degree from Ireland as well. These folks and those that followed them used the fast running waters to saw lumber, grind grains, and process wool. The Tay River’s origins were the waters which flowed in from up past Bob’s Lake and made its way through Perth, all the way to Port Elmsley. 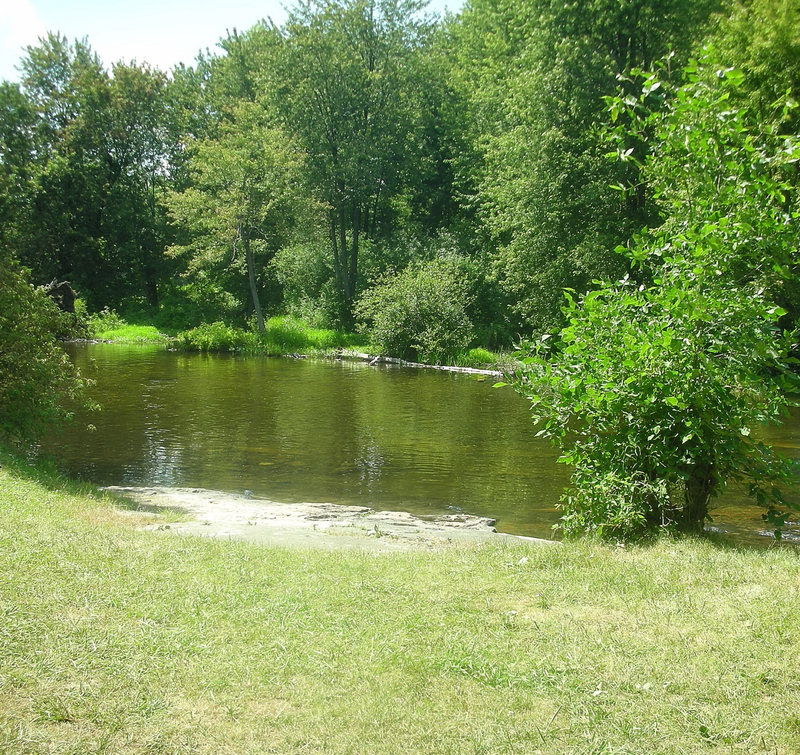 Our swimming hole was known simply as ‘Carl Adams’ and was named for one of the owners of a nearby lumber mill located on Concession 1 lot 12 of Bathurst township. Lumber was produced at that mill until the early 1900s and it was also owned by the Ritchie family at one time. The low, flat rocks along the shore provided a natural seating area where our Mother could watch us splashing in the water. We were always eager to go for a swim on those long, hot summer days when the sun was beating down and we couldn’t seem to get a cross-breeze flowing through the old house. Although the surrounding trees have grown and matured, the swimming hole hasn’t changed much over the years. The Tay flows past in a steady stream, sparkling in the hot July sun and the flat rocks beckon us to sit for a while and remember simpler times. This entry was posted in Short Stories and tagged Carl Adams, lanark county, Tay River. Lovely photo. Sure brings back fond memories of hot summer days and a fun and refreshing swim. I was trying to remember if there was ever anyone else there while we were swimming. I remember riding my bike back to Carl Adams every chance I got, on those long, hot, summer days that seemed to go on forever.